In Summer 2016 the Wellcome Library acquired two maroon metallic boxes containing a selection of product literature issued by the Wellcome Foundation pharmaceutical company from the 1940s through to the 1960s (Wellcome Library reference: WF/M/PL/437). These have been added to the Product Literature section of the Wellcome Foundation archive and are available to researchers. According to the donor, a former Wellcome Foundation Plc employee based at the company’s Dartford site, this advertising and marketing material was kept in a customer facing department, probably by staff who answered enquiries from wholesalers and traders, using the leaflets as a reference source on the product range. They clearly have additional operational uses as many are inscribed with a ‘PMR’ number – thought to mean Product Marketing Register- or the name of the printers/artists on the front. 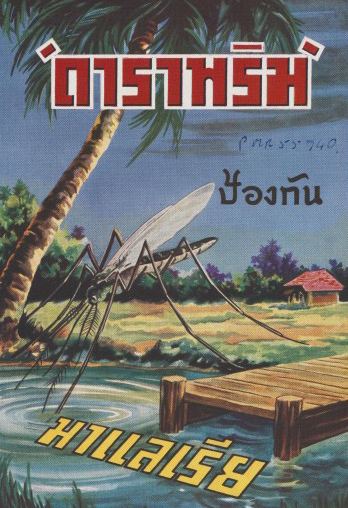 Produced for medical and veterinary professionals, the leaflets are mostly in English but also include a selection in French, Dutch Spanish and one in a Lao script (probably for Thailand, marketing a treatment for filariasis). Products are advertised in vivid, engaging and sometimes quirky designs. Promotional leaflet in Lao script. Wellcome Library reference: WF/M/PL/437. 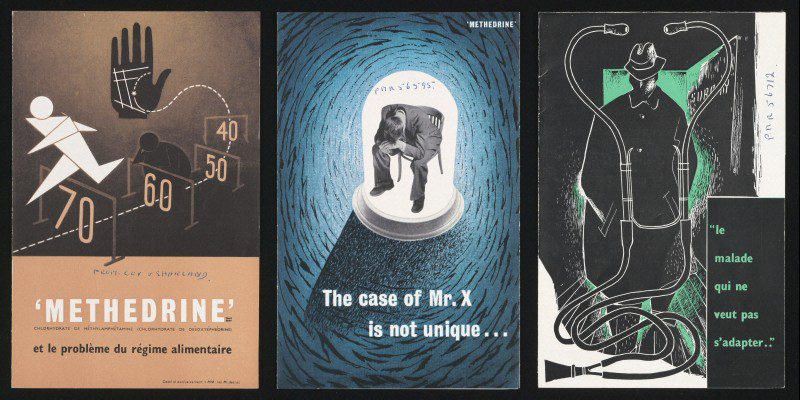 One series of leaflet designs that stand out to me are those for Neo-epinine, a remedy for bronchial asthma, “equal to adrenaline” and “superior to ephedrine”. Neo-epinine was marketed in a number of ways that illustrate the slogan “Free to breathe again…”, including a dove flying out from an opened cage, a rural scene of rolling fields, sailing boats at sea and heavenly cherubs blowing wind. Neo-epinine leaflets. Wellcome Library reference: WF/M/PL/437. 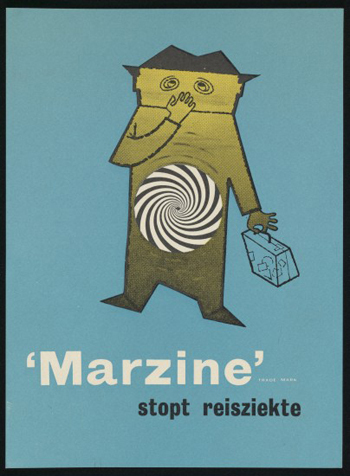 Another favourite of mine are the somewhat psychedelic designs for Marzine, an anti-travel-sickness medicine. One promotional card depicts a rather green looking (cartoon) male voyager with a black and white swirling pattern substituted for his stomach. This reminds me of the of the 1960s television programme ‘The Time Tunnel’ in which two scientists are regularly whisked to other eras, tumbling and spinning through a black and white vortex. Leaflet for Marzine. Wellcome Library reference: WF/M/PL/437. On a more sombre note are two designs for methylamphetamine hydrochloride, a chemical stimulant (widely used by the armed forces of all nations during the World War II and US soldiers during the war in Vietnam), and marketed under the trade name Methedrine by Burroughs Wellcome from 1940. In these leaflets, which appear to date from the early 1950s, Methedrine is promoted as a “valuable adjuvant in dispelling mental depression and overcoming apathy” and a treatment that compared not unfavourably to results of treatment by ECT. It is also recommended for use in treating alcoholism and drug addiction, epilepsy, allergic states, narcolepsy, obesity and enuresis. Because of methylamphetamine’s high abuse potential, addictive properties (‘mother’s little helper’), use as a recreational drug and uncomfortable symptoms of sudden withdrawal it was removed from sale in the late 1960s and soon after became a controlled substance. Leaflets for Methedrine. Wellcome Library reference: WF/M/PL/437. One leaflet for Methedrine shows a dejected-looking man leaving a GP’s dark and shadowy surgery undiagnosed with any organic complaint. The other has a rather ‘Hitchcockian’ image of a spot-lighted man holding his head in his hands surrounded by a zig-zag pattern that hints at anxiety and despair. 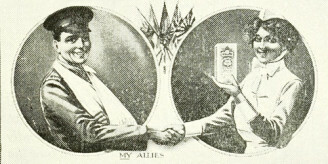 In contrast, a third leaflet jauntily promotes the ‘pick-me-up’ and slimming effects of Methedrine, as a lithe graphic figure leaps over an athlete’s hurdles whilst an overweight figure leans wearily on the one behind. 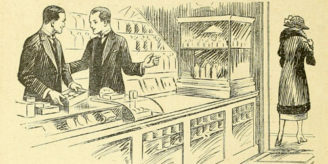 Humour is a common theme in the advertising literature. 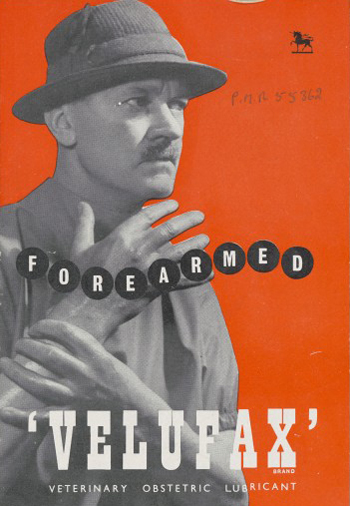 Let’s contemplate the image of a menacing vet holding up a shimmering forearm and looking rather like he’s about to go on a dangerous safari (maybe had imbibed some Wellcome Foundation Methedrine…), accompanied by the slogan ‘Forearmed’. This was used to advertise veterinary obstetric lubricant Velufax – “a bland pleasant-smelling cream, specially designed for application to the hands and arms prior to carrying out obstetrical manipulations, rectal or vaginal examinations…”. Leaflet for Velufax. Wellcome Library reference: WF/M/PL/437. As one would expect, images of cute animals are heavily relied upon to promote veterinary medicines, although the image endorsing “Combestrol for the best capons” is perhaps not so appealing to animal lovers, being aimed at the poultry industry. 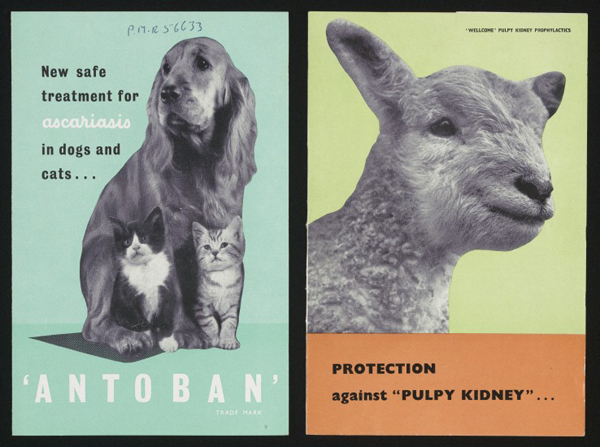 Leaflets for veterinary medicines. Wellcome Library reference: WF/M/PL/437. There is a mystery connected to the boxes. The contents of one box are filed and divided in alphabetical order, covering M-Z. The second one is a miscellaneous collection and although many of the products begin with the letters A through to E, it rather begs the question was there a third box which has gone astray at some point in the last 50-60 years? 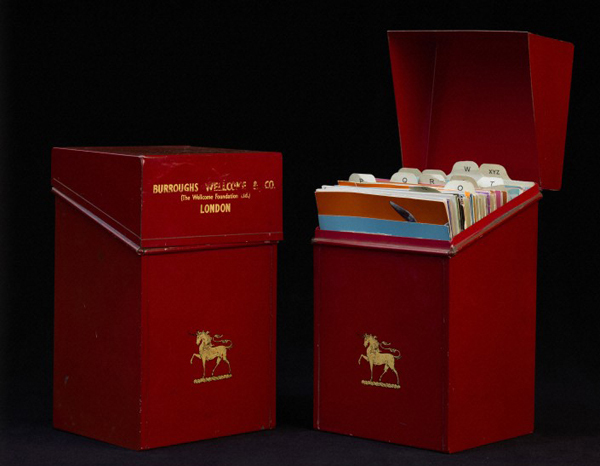 Are you a former employee of Wellcome Foundation and recognise these boxes? Do know of the existence of a third box? Get in touch with us and help solve the mystery! Metal boxes holding Wellcome Foundation product leaflets. Wellcome Library reference: WF/M/PL/437. Burroughs Wellcome and Wellcome Foundation product literature is a unique, valuable resource for historians of advertising and graphic design, as well as for historians of medicine and pharmaceuticals. A comprehensive range of Wellcome Foundation product literature can be found in the company archive.